Ten Speed Press, 9780399580024, 288pp. Written by the long-time manager of the renowned Alan Chadwick Garden at the University of California, Santa Cruz, this substantial, authoritative, and beautiful full-color guide covers everything you need to know about organically growing healthy, bountiful fruit trees. 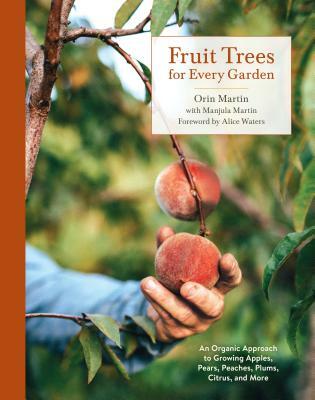 For more than forty years, Orin Martin has taught thousands of apprentices, students, and home gardeners the art and craft of growing fruit trees organically. In Fruit Trees for Every Garden, Orin shares--with hard-won wisdom and plenty of humor--his recommended fruit varieties and techniques for productive trees, including apple, pear, peach, plum, apricot, nectarine, sweet cherry, orange, lemon, fig, and more. If you crave crisp apples, juicy peaches, or varieties of fruit that can never be found in the store, there's no better way than to grow them yourself. Whether you have one tree or a hundred, Orin gives you all the tools you need, from tree selection and planting practices to seasonal feeding guidelines and in-depth pruning tutorials. Along the way, you'll gain a deeper understanding of the core principles of organic gardening and soil stewardship: compost, cultivation, cover crops, and increasing biodiversity for a healthier garden. This book is more than just a gardening manual; it's designed to help you understand the why behind the how, allowing you to apply these techniques to your own slice of paradise and make the best choices for your individual trees. Filled with informative illustrations, full-color photography, and evocative intaglio etchings by artist Stephanie Martin, Fruit Trees for Every Garden is a striking and practical guide that will enable you to enjoy the great pleasure and beauty of raising homegrown, organic fruit for years to come. ORIN MARTIN is manager of the three-acre Alan Chadwick Garden (home of 600 fruit trees) at the Center for Agroecology and Sustainable Farming Systems at the University of California, Santa Cruz, and manager of the orchard at UCSC's Farm & Garden. Since 1977, he has taught classes, lectures, and workshops to thousands of home gardeners, apprentices, students, and budding farmers who have gone on to found and lead organic farms, teaching gardens, and food justice projects around the country and the world. MANJULA MARTIN, Orin's daughter, is a writer, managing editor of the literary magazine Zoetrope: All-Story, and editor of the book Scratch: Writers, Money, and the Art of Making a Living. STEPHANIE MARTIN is a painter and printmaker living on the California coast with her husband, Orin Martin. Her intaglio etchings depict the flora and avifauna of her native landscape. "Here you have all the practical tools to create your own orchard of any size—information on rootstocks, pruning, thinning, and a thrilling array of varieties—but moreover, you have Orin's wise and gently wry voice to guide you through it."